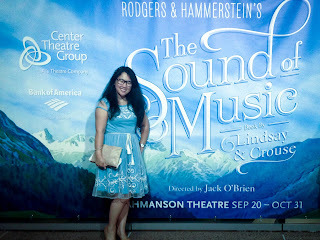 How to describe The Sound of Music non equity tour that is passing oh too quickly through Thousand Oaks this weekend? Sensational! Jill-Christine Wiley was born to play Maria Rainer! This is her second year on tour and you can see why the audiences and producers love her performance. She makes Maria her own with a fresh, charismatic, charming, vibrant and loving rendition. And it was very smart of her not to try to copy Julie Andrews vocally and thanks to the changed (for the better) tempo of the music you can listen to everything with fresh ears. Frankly after the first few notes hearing her sing I was hooked and had no thoughts of previous Marias I had seen. 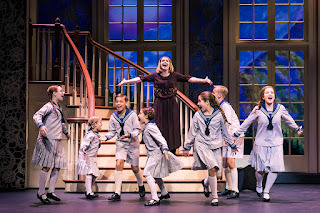 Her chemistry with the children was spot-on (especially scene stealer Emily Strugatsky as Brigitta) and the build up of her relationship with Captain von Trapp (Mike McLean) was perhaps slower and quieter then most would appreciate but I thought it came across as believable and charming. Lauren Kidwell (left) and Jill-Christine Wiley. Photo by Matthew Murphy. Similar to when I saw the 2015 equity tour starring Ben Davis and Kerstin Anderson at the Ahmanson Theatre, the audience was on their feet before the nun ensemble had even had a chance to complete their bow. 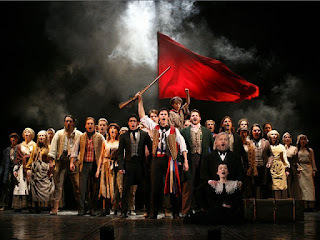 And boy was the cast deserving of their standing ovation. 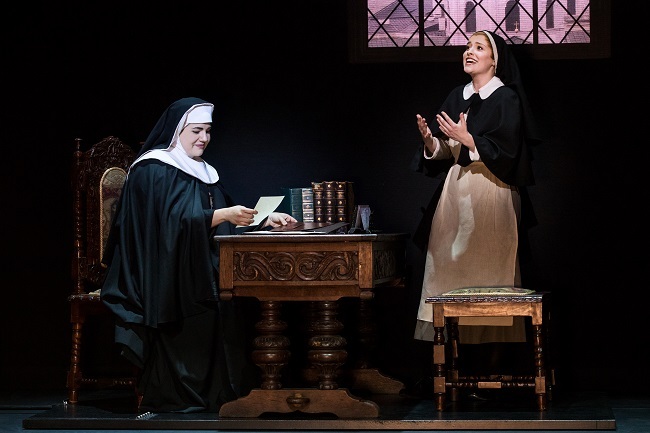 From the nun ensemble with their glorious harmonies and heavenly notes to Lauren Kidwell (The Mother Abbess) who received the heartiest of applause to the ever deserving leading lady Jill-Christine Wiley (Maria Rainer), the cast were aces and you're not going to want to miss your chance to see them live! 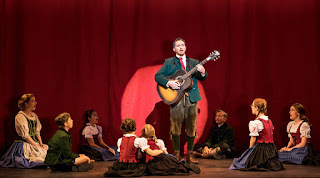 Mike McLean as Captain von Trapp. Photo by Matthew Murphy. 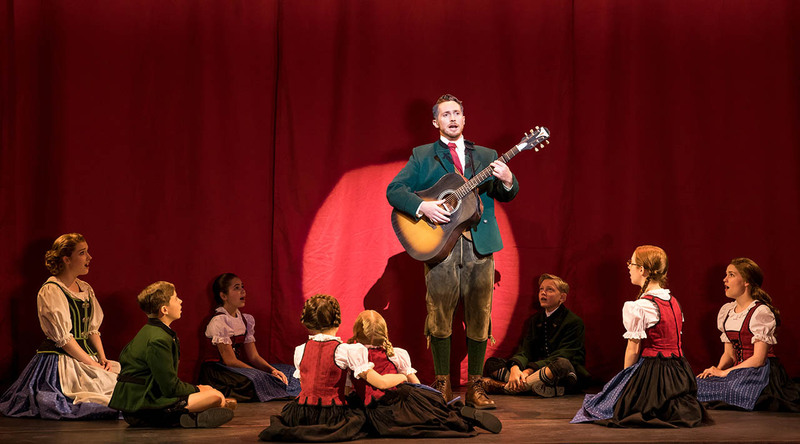 In the show's most jarring and unconventional casting choice, Mike McLean as Captain von Trapp is bound to raise eyebrows especially from those whom are used to a captain with a stoic, stern and commanding presence. 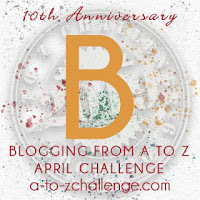 Looking back though at my 2015 review I see that Ben Davis' performance was filled with "quiet moments when you could see his internal conflict etched across that beautiful face, especially when hearing his children sing for the first time [you get the impression that perhaps he and his late wife had sung that song before and memories and pains are coursing through him] and during his gorgeous and emotionally charged Edelweiss." 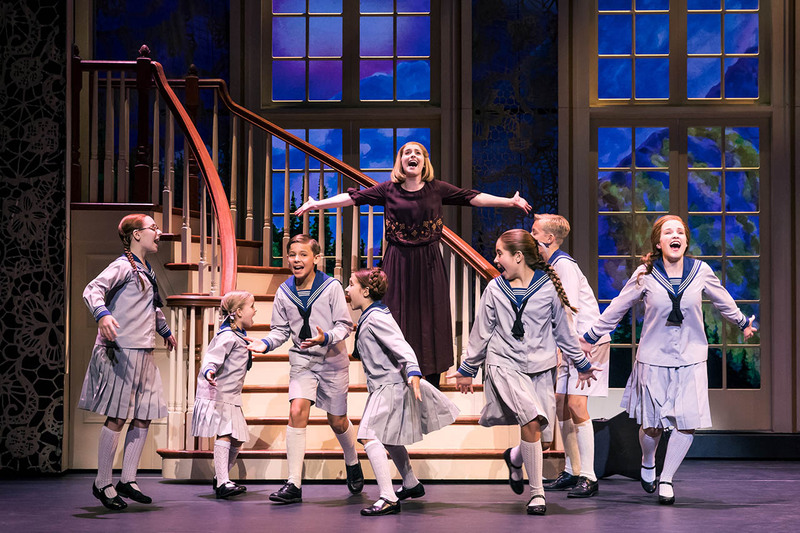 Director Matt Lenz (based on Jack O'Brien's original direction) has chosen a nuanced and softer, more personable portrayal of Captain von Trapp for his star. And that's where McLean really excels - in his relationships onstage. There is the charming awkwardness during Act One between himself and a beautiful Kate Turner (Elsa Schraeder) that for a brief moment has you actually rooting for them, the terrific transformation in his relationhip with the children, and the slow burning love he discovers with Maria with a very exciting laender. And what really makes this Captain tick? The Third Reich. We see strong emotion and passion whenever the topic comes up and his reaction to being surrounded by swastikas during the concert is chilling leading into his fabulous Edelweiss with the most beautiful and riveting "Bless my homeland forever" closing line. Lauren Kidwell (Mother Abbess) appears to have been similarly cast as younger to suit a sister-sister confidant relationship between the Mother Abbess and Maria, similar to Ashley Brown in 2015. And the chemistry between the two ladies works well. I'm not confident it made that much of a difference in Kidwell's performance compared to others except that funny enough during "Climb Ev'ry Mountain" I thought she was actually going to break out in dance like Sister Act. LOL. But it really is her vocal chops that had the audience in rapture. That same "Climb Ev'ry Mountain" was spectacular and quite the way to end Act One showing off her vocal power and strength. And when she quotes Psalm 121 as she is encouraging the von Trapp family at the finale before breaking into Finale Ultimo with the nun chorus, you sense real compassion and love and faith in her performance. Jill-Christne Wiley and the Children. Photo by Matthew Murphy. Rounding out the cast, Jake Mills (interview) managed to make Max Detweiler three dimensional and redeemable while showing off a surprisingly great vocal authority during his two crowd pleasing numbers, Kate Turner was all things beautiful and yet gave Elsa a heart too making the audience suffer when she could not see things Georg's way and we watched her walk away head high, Lauren O'Brien might look a bit old for the role (heck, she is a college graduate) but her second act duet with Wiley was a favorite, Hunter Brown too looked a bit old to be playing a 17 year old Rolf but his short second act scene delivering a telegram was chilling, Stephanie Gray was a sympathetic and likable Frau Schmidt with fun interactions with Scott Fuss as Franz. James Taylor Odom (Admiral von Schreiber) had recently been seen in Thousand Oaks as the D'ysquith Family in the hilarious 2017 A Gentleman's Guide to Love and Murder non equity tour and so it was a treat to see him perform again even if only for such a small but powerful scene. I'd love to see him as Captain von Trapp (he understudies Captain von Trapp and Mx Detweiler). Again, special kuddos to the team behind the scenes. Douglas W. Schmidt's gorgeous backdrops 4 years later still deserve an applause in and of themselves. My dad who had not seen the 2015 tour kept talking about the gorgeous cathedral wedding scene backdrop and staging. And the scene changes come across as so effortless and happen so quickly that in a blink of an eye you could miss the start of a new scene. Natasha Katz' lighting design continues to be spot-on. And cheers to Music Director Michael Gildin and his excellent sounding orchestra for filling the theatre with live music (including 2 violins). Only 5 more performances in Thousand Oaks before heading to Wausau, WI on 12 February and Bloomington, Illinois on 13 February! 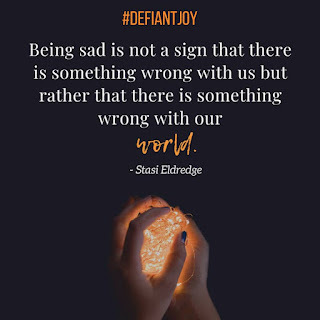 Friday, February 1, 2019: 8 p.m.
Saturday, February 2, 2019: 2 p.m.
Saturday, February 2, 2019: 8 p.m.
Sunday, February 3, 2019: 1 p.m.
Sunday, February 3, 2019: 6:30 p.m.